The University of Plymouth has won a second award in less than a month in recognition of its commitment to sustainable practices. Just weeks after winning a fifth Green Gown Award since 2011, the University has triumphed in the Sustainability Reporting (Public Sector) category of the Building Public Trust in Corporate Reporting Awards (BPTA). 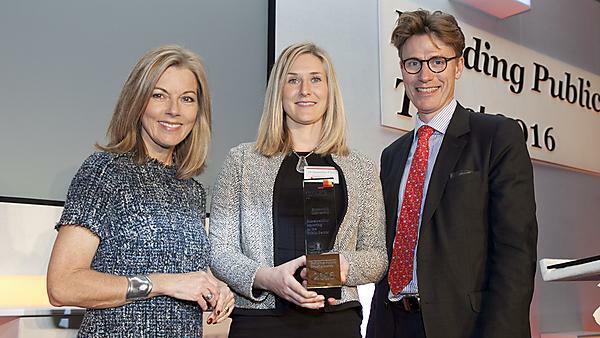 Presented by PwC and the National Audit Office, the award assesses the quality and relevance of sustainability reporting offered through an organisation’s website or corporate reports. It also examines its commitment to sustainable development and how that is factored into core business strategies, as well as evidence the organisation understands the material issues and impacts of embedding sustainable practices. This second award is largely based on Plymouth’s fourth Sustainability Report, which was produced by Dr Samantha Price, Sustainability Manager in the Estates and Facilities directorate. Aimed at those with an interest in sustainability performance, it was based on the Global Reporting Initiative, an internationally recognised framework for sustainability disclosure. Established in 2002 and now in their fourteenth year, the Building Public Trust in Corporate Reporting Awards were created to reward and celebrate outstanding reporting and now cover the FTSE 100, FTSE 250, private, public and charity sectors. All 18 of the awards presented this year recognise the achievements of organisations that have differentiated themselves through the clarity of their reporting. In its citation, the independent judging panel for the Building Public Trust in Corporate Reporting Awards praised the University for the way its report presented issues and actions in a straightforward and accessible way, adding that it “tells a clear story very well”. This award adds to a growing list of accolades the University has secured in recent years for its work to embed sustainability within its campus operations, research agenda and academic programmes. On November 10, it was named the winner of the Green Gown Awards’ Sustainability Reporting category, which was also judged by PwC UK and assessed the quality and relevance of publicly available information provided by institutions.